Movies, radio, television and more recently the internet each brought their own revolutions in communication, lifestyles and society. Current scientific research quietly hints at the next wave – the blending of computers with the human mind itself. Forget avatars and 3-D games, we’re on the threshold of chips in our brains that will enable us to experience the lives of the rich and famous. It’s coming, but are we ready? EVOKE is set in the very near future – where politicians still lust for power, people drive ordinary cars to ordinary work and eat fast-food. What’s different is EVOKE – a newly available network providing not merely information or virtual reality, but a chance to become someone else for a while. With EVOKE we can finally be in an exotic relationship, win the Masters Golf Tournament, walk the catwalk in Paris or dine at the Four Seasons. If we can be anyone and do anything online, who are we in our real lives? More importantly – who controls what we experience and distributes access to the first chips? 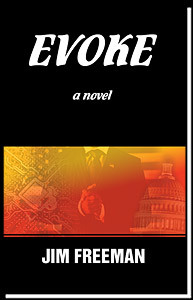 The characters provide an intimate look at social and political change through the eyes of people accessing EVOKE, as well as those on the outside – from the politicians who control it, to businessmen hot after its commercial potential, to ordinary people who struggle for meaning in their lives while facing unlimited pleasure. It’s a chillingly realistic look into our future – our near future. Are you ready? Are any of us? Any Robert Ludlum fan will love this book. I made the mistake of starting it at bedtime, and ended up finally turning out the light at 3AM. The characters are well defined and the plot fascinating -- if a little scary. Think it couldn't happen? Think again. This was an unknown writer to me, but I will be looking forward to his next book, for sure.